A learned, respected, accomplished man leaves a life of worldly success to serve Christ among "the least of these." Albert Schweitzer was a Renaissance man who basked in the utmost respect of the world's intelligentsia. Schweitzer had doctorates in philosophy, theology, and medicine. He was a well-respected author, a concert organist, and a world authority on Bach. He won the Nobel Peace Prize in 1952. But he left a life of acclaim to pursue the God-given call to treat all life as sacred, especially in those places on the fringe-in Africa. In what is now Gabon, people saw him daily with his stethoscope on a distended belly and heard him nightly performing classical music on his piano. In a time when many people feel small and inconsequential, Schweitzer's life is a testimony to the power of one person's sacrifice, purpose, and commitment to treat all God's creations as sacred. 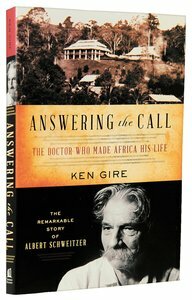 About "Answering the Call (Albert Schweitzer) (Christian Encounters Series)"
this influence taught Anne to push herself beyond the day's limitations. She managed her home, educated her children, encouraged her husband, and sought her Lord-all with a poet's heart. Christian Encounters, a series of biographies from Thomas Nelson Publishers, highlights important lives from all ages and areas of the Church. Some are familiar faces. Others are unexpected guests. But all, through their relationships, struggles, prayers, and desires, uniquely illuminate our shared experience Anne Bradstreet is recognized as one of the most important figures in the history of American literature, yet the majority of her poetry remained private until after her death. As a Puritan wife and mother, Anne knew that sharing her views and opinions with others was considered a sin, but she clearly valued knowledge and intellect, and was a free thinker. Bradstreet's work serves as a document of the struggles of the hardships of colonial life and in some ways is a testament to the plight of the women of the age. Anne's life was a constant struggle, from her difficult adaptation to the rigors of the new land, to her constant battle with illness. She turned inward and let her faith and imagination guide her through the most difficult moments. Her poetry, filled with the love she had for God, her husband, and her eight children, showcased her intense devotion to being a good wife, mother, and Christian.